Overview - The Ultimate Matrix Collection presents the complete adventures of machine battling truth-seekers Neo (Keanu Reeves), Trinity (Carrie-Anne Moss) and Morpheus (Laurence Fishburne) in all three of the Wachowski brothers’ post-modern epic films. This collection will contain, for the first time, all three HD DVD versions of The Matrix series with more than 35 hours of bonus material in 5 double sided discs. She jumped in the air and the camera swirled around her. At that one moment, everything about big-budget moviemaking changed. While many late-1990s science fiction films such as 'Dark City' and 'Strange Days' embraced a similar grim, urban aesthetic, 'The Matrix' absorbed it, internalized it, and expanded upon it. The original film would be seminal in stretching the boundaries of computer-generated imagery -- literally. Characters run along walls before delivering a kick. Bullets visibly ripple through the air, moving slowly enough for their intended targets to move out of the way. Neo (Keanu Reeves) and Trinity (Carrie-Anne Moss), wearing black trench coats and black sunglasses, shoot their way through an office lobby leaving heroic amounts of shattered concrete and dead bodies. By the time it was over, audiences had a new benchmark for what constituted cool. It's been nearly a decade since 'The Matrix' first ripped through the pop culture consciousness, and two sequels and over a billion dollars in worldwide box office later, the dust has finally settled long enough that it's possible to look back and better assess the film's place in the sci-fi cinematic pantheon. It's clear now that the writing and directing team of Larry and Andy Wachowski were not content to just drape everyone in black and call it style. Nor did they simply rely on their extraordinary visual sense. 'The Matrix' depends on obvious religious parallels (Neo has been interpreted to be a spiritual stand-in for everyone from Jesus Christ to Buddha) to give it a familiar, universal feel and a philosophical bent. But, like the outlet embedded in the back of Neo's head, the real power of 'The Matrix' is its ability to plug into the psyche of its target audience: young males. The idea that our world is an elaborate simulation meant to divert us from the knowledge that our bodies are being enslaved and harvested for energy by sentient computers is at once heady, ridiculous and supremely clever. As such, it played right into the hearts and minds of a generation. Much as 'Crouching Tiger, Hidden Dragon' introduced mainstream American audiences to the Chinese martial arts films, 'The Matrix' introduced us to the kinetic visuals of Japanimation, John Woo-inspired violence and the Cyberpunk ethos pioneered in the novels of William Gibson. Though the first 'Matrix' is undoubtedly a classic of its genre and a highly-influential blockbuster, its cross to bear is its two sequels. After the first film grossed over $500 million worldwide to become the sleeper sensation of 1999, it was inevitable that there would be follow-ups. And so the Wachowskis and Warner devised back-to-back sequels, shot over a period of year and to be released six months apart in the spring and fall of 2003. 'The Matrix Reloaded' and 'The Matrix Revolutions' would form a trilogy with the original 'Matrix,' and gargantuan box office seemed inevitable. Indeed, 'Reloaded' opened huge, but the sequels seemed to quickly suffer from the law of diminishing returns. It is impossible now to look back on 'The Matrix' phenomenon and not see the kinks in the armor -- namely, that 'Reloaded' and particularly 'Revolutions' disappointed not just the mainstream but also the franchise's massive legion of devoted followers. Not since the 'Star Wars' prequels has a sure-fire sci-fi franchise suffered such a steep drop-off in cultural relevance. Unfortunately, the passage of time has done nothing to improve 'The Matrix' series. While the first film can still be appreciated for its prescient vision and trail-blazing aesthetics, 'Reloaded' and 'Revolutions' both feel like a creative treading of water, or worse, parasitic cash-ins. All that black leather and Euro-tech interior design starts to feel awfully tired by the time we get to silly, maudlin climax of 'Revolutions.' The religious allusions also feel belabored and incredibly ham-fisted. Even the once-pioneering effects begin to veer toward the campy and self-referential -- neither 'Reloaded' or 'Revolutions' introduced any new concepts that could approach the first film's "bullet time" -- instead, they only regurgitated the same old tricks. Yet we still have a lot to be thankful for in The Matrix trilogy. At its core, it embodies a delicious paradox: using state-of-the-art technology, it tells its story of mankind's near destruction brought about by our reliance on state-of-the-art technology. In the dark ages of the late 1990s, with society reaching a point of no return in its dependence upon the internet, cell phones and global positioning systems, 'The Matrix' asked moviegoers to think about the implications -- and to never underestimate the power of black leather. Simply put, 'The Matrix' may be the most important release yet for the HD DVD format. There have certainly been some high-profile titles released thus far -- 'King Kong,' 'Children of Men' and 'Fast and the Furious: Tokyo Drift' all come to mind -- but none have had nearly the lofty expectations riding on their plastic shoulders as this one. Add to that the fact that Warner has chosen to release 'The Matrix' trilogy on HD DVD well in advance of a Blu-ray version, and many of the format's most ardent supporters are looking to this release as the sales trojan horse that will help open the mainstream floodgates and ensure that HD DVD can, if not win the format war, then at least hold its own in its hard-fought battle against Blu-ray. Needless to say, Warner had its work cut out for it, but HD DVD fans will be pleased to hear that Warner has absolutely delivered the goods. In fact, this release compares favorably to anything I've seen yet on either high-def format. All three 'Matrix' films look fantastic on HD DVD, and I'd be more than happy to whip out any of them when I need a demo disc to show off my system. 'The Matrix,' 'The Matrix Reloaded' and 'The Matrix Revolutions' are each presented in 1080p/VC-1-encoded transfers, and framed accurately in 2.40:1 widescreen. Given the mixed reaction the original transfers of all three initially received when first released on standard-def DVD, the good news is that Warner has clearly gone back and remastered the trilogy, minting new high-def masters. Doing a direct compare with the original discs, the results are immediately obvious. One of the many impressive aspects of the set as a whole is its consistency -- despite the four-year gap between 'The Matrix' and its two sequels, I could scarcely tell any difference between them. Cue up any sequence of any of the flicks, and prepare to be suitably wowed. The most immediately noticeable upgrade is detail. Though I felt the previous DVDs certainly looked good, all the black-on-black of the 'Matrix's trend-setting visual aesthetic often faded into inky mush in standard-def. Not so in high-def, where fine texture is a revelation. For example, during the scene in the first 'Matrix' when Neo and Trinity blast their way into the bank, the supple details of the clothes and the shiny black leather is so good I wanted to freeze-frame and just revel in its ultra-realism. One other compare was particularly revealing -- there is a push-in shot through a grill that the cops are ensconced behind, and on the DVD, it looks pixilated and jagged -- but on the HD DVD, I never saw a single moment where the image broke up or looked stair-stepped. This is the kind of three-dimensional, picture-perfect image high-def is all about. The colors of 'The Matrix' films have always been controversial. The dominant hue is clearly green. Though there are many uses of deep purple and occasional splashes of incredibly vivid reds, the transfers have been obviously skewed. Yet I was impressed with the level of detail and "naturalism" (albeit highly stylized) that remained despite the tint shift. And all things considered, fleshtones are as accurate as possible. I was also relieved that Warner did not overpump or oversaturate the transfers -- there's no bleeding or chroma noise, and again, consistency is excellent. Finally, compression artifacts are not an issue. There is not a moment of macroblocking or any noise, even on the many flat surfaces and static shots, which often hold on a particular image for what seems like minutes. And the source itself is beautifully maintained -- there is a bit of grain here or there, but it is clearly part of the intended effect and there are no instances of dirt or blemishes. This is really fantastic stuff -- 'The Matrix' trilogy easily earns an exemplary five-star video rating. Since its original announcement, there has been some controversy regarding this set's full tech specs. Warner never released a complete breakdown of which audio formats would make the cut, so speculation has run rampant. Happily, the studio has opted to include full-blown Dolby TrueHD 5.1 surround tracks (48kHz/16-bit) for each film, as well as optional 640kbps Dolby Digital-Plus 5.1 surround mixes. I was just as impressed with the audio as I was the video -- this one absolutely rocks the house. All three 'Matrix' are naturals for high-resolution audio. Sure, there are plenty of long, talky bits in each installment, but there are also a lonmg list of top-flight action sequences to choose from when want to drive your home theater rig into the ground. My favorites are the office break-in from the first film, both the humongous car chase and extended rave scenes about mid-way through 'Reloaded,' and the sheer aural delight of the climax in the otherwise-silly 'Revolutions.' The aggressiveness of the surrounds is phenomenal throughout -- imaging is seamless between channels, and the "wall of sound" the emanates from the rears is incredibly forceful. These are the kind of sequences you go back and rewind over and over again, just to revel in their effectiveness. Dynamics are also top-notch. Just as "bullet time" revolutionized modern special effects, the sound design here is also pioneering. In hindsight, it shouldn't have been a surprise that the original 'Matrix' swept most of the 1999 Oscars given for tech categories over 'Star Wars Episode I: The Phantom Menace.' The use of extended low bass, and the way the mingling of natural and mechanical effects and tones to create a chilling, suspended-animation-like aural effect is fantastic. The Dolby TrueHD format easily handles this complex presentation, with airtight low bass extension all the way down to the lowest frequencies. Mid- and high-range is also wonderfully clear and free from irritating harshness. As loud as this soundtrack gets, I never felt bombarded with treble, which is can be a problem with high-impact soundtracks, where it often seems like the sound mixers simply crank everything up to eleven. 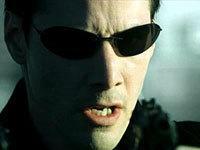 Dialogue also is accurately balanced in the mix -- Keanu Reeves' now-famous utterance of "Whoa!" is (for better or for worse) perfectly intelligible. For that reason alone, 'The Ultimate Matrix Collection' earns yet another five-star for audio. 'The Matrix' trilogy has been released on standard-def DVD numerous times -- so many, in fact, that trying to make sense of which version is which is about as complex as trying to unravel the intricacies of the Matrix itself. Warner is not, of course, a dummy studio, and knows that diehard fans will always buy (and re-buy) the same movie over and over so long as the latest incarnation is fancier than the last. Thankfully, however, the studio has apparently jettisoned the double-dip philosophy for HD DVD (in this case, anyway), and is giving us the ultimate Matrix experience the first time out. As such, anyone picking up this gargantuan five-disc set will not miss out on a single extra that has come before. 'The Ultimate Matrix Collection' compiles every last commentary, featurette, vignette and TV spot on all of the previous editions, all in one high-def package. However, there is one big caveat. Though the feature films themselves and the HD DVD-exclusive picture-in-picture commentaries (see below) are presented in 1080p video, the remaining supplemental content is 480p/i/MPEG-2 only. It's a bit disappointing, because though it is fantastic to have so much content spread across only five (albeit double-sided) discs, the lack of upgraded video across the board leaves 'The Ultimate Matrix Collection' a bit shy of being a complete, total high-def immersion in the world of The Matrix. An additional note: Warner is also releasing 'The Complete Matrix Trilogy' on HD DVD, day-and-date with the 'Ultimate Collection.' The video and audio specs for the films themselves are identical; the studio has simply dropped the flip-sides of the three movie discs, plus the two bonus 'Matrix Experience" discs. It's a very attractive alternative for fans who don't desire the hours and hours of added material included here, especially since the video and audio quality remains as strong as it is here, and 'The Complete Matrix Trilogy' also retains all of the HD DVD-exclusive extras (see below). Now onto the avalanche of extras. Yes, the breathless press release was correct -- there really are over 35 hours of bonus material here. Things kick off on Side 1 of the original 'The Matrix' (Disc 1) with a Written Introduction by the Wachowski Brothers, a feature which is similarly included for each of the two sequels. It's fine enough, but only a hint at what is to come. The fun really begins with a suite of audio commentaries. Each of the three films share a common set of commentary tracks -- a "Philosopher's Commentary" featuring Dr. Cornel West and Ken Wilber, and a "Critics Commentary" with noted cinema journalists Todd McCarthy, John Powers and David Thomson. I sampled about thirty minutes of each (on all three installments), and found both groups of participants fascinating and often humorous. Granted, the "Philosophers" at times seem to stretch the significance of the later installments in the series a bit, but it only serves to make the "Critics" commentaries that much more hilarious by comparison -- Warner allowed them free reign to totally rip on the sequels, and their often pointed criticisms on the apparent self-indulgence of the Wachowski Brothers and the ever-more-ludicrous plot contrivances is highly entertaining. God, how I wish George Lucas would allow something similar to be put on the DVDs of his 'Star Wars' prequels! Side 1 of the original 'The Matrix' (Disc 1) also includes two additional commentaries of its own. Carried over from the very first DVD release of the film is a track with effects personnel Zach Staenberg and John Gaeta, plus actress Carrie-Anne Moss, as well as a music-only track (in Dolby Digital-Plus 5.1) featuring comments from composer Don Davis (which are inserted in the silent passages, in between cues). The cast and crew track was certainly informative back before Warner re-issued the film so many times, but now it is easily eclipsed by the copious video material. As such, best to leave this one off your checklist. The isolated score, however, is great to have, and it's also wonderful to hear from the composer as they're so often overlooked, even on box sets as expansive as this. Side 1 of 'The Matrix' also includes 'The Music Revisited,' an exhaustive catalog of no less than forty-one(!) audio-only music cues from the film. This was originally included as an easter egg on the original DVD set, but is now very easy to access right from the Extras menu. Finally, closing out this side of Disc 1, are the original Theatrical Teaser and Trailer, eight TV spots, and a music video for Marilyn Manson's "Rock is Dead"
Side 2 of 'The Matrix' continues with a documentary and quite a few video featurettes and vignettes. 'The Matrix Revisited' was first released as a stand-alone DVD, but has been integrated here in its original, complete form. It runs 122 minutes, and is quite exhaustive. Chronicling the entire production from November 1997 (the beginning of pre-production) to April 2000 (as preparation for the first sequel commenced), this is a thorough, exciting video diary that alone would have been enough coverage for me on the making of 'The Matrix.' What's great about taking this return trip is recognizing how few people involved even understood the movie the Wachowskis were making. Yet all took a leap of faith, from the cast (all interviewed here) to the effects crew, all endeavoring to create something never before seen, no matter how seemingly incomprehensible. 'The Matrix Revisited' is excellent, and for me is easily the highlight of all of the 'Matrix' extras. Also on Side 2 of Disc 1 are the infamous "Take the Red Pill" and "Follow the White Rabbit" vignettes that were presented as branching segments on the original DVD release. The material runs about 40 minutes, and each vignette is a narration-free, you-are-there look at a specific action sequence or other key scene. "Take the Red Pill" includes: "What is Bullet Time?" (6 min.) and "What is the Concept" (11 min. ); "Follow the White Rabbit" includes: "Trinity Escapes" (1 min. ), "Pod" (2 min. ), "Kung Fu" (4 min. ), "Wall" (2 min. ), "Bathroom Fight" (2 min. ), "Government Lobby" (4 min. ), "Government Roof" (1 min. ), "Helicopter" (1 min.) and "Subway" (4 min.). Moving onto 'The Matrix Reloaded' (Disc 2) some of the content seems to have been reorganized, at least compared to the hierarchy of the original DVD releases. In addition to the aforementioned Written Introduction and Philospher's & Critic's Commentaries common to each of the movie discs, also included here are 42 minutes of "Enter the Matrix." This featurette compiles all of the footage shot by the Wachowski brothers specifically for the videogame. Story points and characters are introduced that built upon the 'Matrix' milieu, and for some, the game was preferable to the two sequels. There are 22 segments total, along with a 1-minute introduction by producer Joel Silver and actress Jada Pinkett-Smith. (Note that the audio for "Enter the Matrix" is Dolby Digital 2.0 stereo only.) Closing out this side of Disc 2 are 'The Matrix Reloaded's original Theatrical Teaser and Trailer, plus eight more TV spots, and a music video for P.O.D. 's "Sleeping Awake." Next is "Unplugged" (40 minutes total) which is probably the best of these sections. The Neo versus "a zillion Agent Smiths" is still an over-the-top, amazing sequence, and is broken down here in ridiculous detail: "Creating the Burly Brawl" (17 min. ), "A Conversation with Master Wo Ping" (10 min. ), "Chad Stahelski: The Other Neo" (2 min. ), "Burly Brawl Action Match" (6 min.) and "Spiraling Virtual Shot: Anatomy of a Shot" (5 min.). Then there is "I'll Handle Them" (17 minutes total), which highlights the Merovingian Chateau sequence: "The Great Hall" (5 min. ), "Building the Merovingian's Lair" (5 min. ), "Tiger Style: A Day in the Life of Chen Hu" (4 min.) and "Heavy Metal: Weapons of the Great Hall" (3 min.). Concluding disc 2 is the very amusing "Exiles" assemblage (18 minutes total). Here all the assorted "exile" characters get their due, sort of like the Island of Misfit Toys of the 'Matrix Reloaded' universe. "Big Brother is Watching: The Architect's Office" (8 min.) is more effects discussion of filming the sequence, which was done almost entirely against green screen. "The Exiles" (9 min.) features the exile cast members, sorta-in character, offering background information on who they play. This is actually one of the more unique and refreshing extras on the set, especially since most of the other supplemental material is so heavy on effects breakdowns. Finally, we get to 'The Matrix Revolutions' (Disc 3). In addition to the Written Introduction and the Philospher's & Critic's Commentaries common to each of the movie discs, Side 1 features another "Behind the Matrix" primer on the third film in the series (24 minutes total): "Revolutions Recalibrated" (6 min. ), "Neo Realism: The Evolution of Bullet Time" (4 min. ), "CG Revolution" (2 min. ), "Super Big Mini Models" (1 min. ), "Super Burly Brawl" (2 min. ), "Double Agent Smith" (3 min. ), "Mind over Matter: The Physicality of The Matrix" (3 min.) and "Future Gamer: The Matrix Online" (2 min.). (Note that the remaining two segments of "Behind the Matrix," "Before the Revolution" [4 min.] and "3-D Evolution" [3 min. ], are continued on side two of Disc Three.) Closing out this side of the disc are the original trailer for 'The Matrix Revolutions' and six TV spots. Flip the disc over and there are six additional sections of featurettes. The approach is again the same, mixing fly-on-the-wall video diary material with on-set interviews with cast and crew. This material was all obviously shot concurrent with 'Reloaded,' as the productions were done back-to-back. "Hel" (28 minutes total) examines the much derided Club Hel sequence. Unfortunately, all that is discussed here is more endless technical and effects aspects, and admittedly I'd grown pretty tired of it all by the time we got to 'Revolutions.' Anyway, the subsections here are: "Coat Check" (5 min. ), "Upsidedown Under" (5 min. ), "Fast Break" (6 min. ), "Exploding Man" (5 min. ), "Gun Club" (2 min.) and "The Extras of Club Hel" (5 min.). Next is "Super Burly Brawl" (17 minutes total), which is yet another fight sequence between Neo and Agent Smith: "Sky Barn" (5 min. ), "Crater" (5 min. ), "The Egg" (3 min.) and "Anatomy of the Superpunch" (4 min., and the best segment here, with a fascinating look at how the faces of Reeves and Hugo Weaving were insanely distorted via CGI to achieve the final effect). Finally, "New Blue World" (26 minutes total) is a catch-all, rounding up various featurettes and segments that apparently didn't quite fit in anywhere else: "Geography of Zion" (9 min., an interesting look at the multi-cultural denizens and their parallels to our current cultural landscape), "The Ships" (6 min. ), "Tour of the Neb" (3 min. ), "Logos Fight Expansion" (3 min.) and "Matrix TV" (5 min., yes, they really did create a featurette on the monitors of 'The Matrix!'). First a word of warning -- both discs 4 and 5 of this collection aren't even in the HD DVD format. Yep, Warner has simply thrown in the standard-def discs from the DVD release of 'The Ultimate Matrix Collection' as double-sided discs. The menus, encoding, 480p video, audio formats, etc., are all exactly the same. In all honesty, this feels like a bit of a cheat. I suspect many who are plunking down cash to purchase (or re-purchase, as the case may be) 'The Ultimate Matrix Collection' on HD DVD are expecting high-definition content across the board. And while I can't argue with the sheer volume of content here, the packaging on the outer box just doesn't make it very clear the full extent of the standard-def extras on much of the set. If quality is what you are after here (and not just the content) you may be disappointed. That said, here's an overview of the 'Matrix Experience" bonus DVDs. 'The Animatrix' is the main attraction of Disc 4. Spurred by the success of the original 'Matrix,' the Wachowskis and Warner enlisted seven top Japanimation artists to create a series of nine short films, with the intention of utilizing different animation forms and styles to expand and deepen the 'Matrix' mythology as preparation began on the two sequels. The nine shorts are: "Final Flight of the Osiris," "Kid's Story," "Program," "World Record," "Beyond," "Detective Story," "Matriculated," "The Second Renaissance Part 1" and "The Second Renaissance Part 2." "Scrolls to Screen: The History and Culture of Anime" is a much-needed 22-minute featurette that pays appropriate tribute to the influence anime had on 'The Matrix.' It is also a very valuable educational tool, at least for an anime ignoramus like me -- the origins and shared techniques of the form are explained, and even if I'm still not really into the genre, at least now I can appreciate its origins and its significance. Side 2 of Disc 4 reverts back to more on the Matrix trilogy. Thankfully, however, we don't get yet more endless montages of green screen. Instead, we get two cultural documentaries (both 61 minutes) examining the impact and legacy of the Matrix series. "Return to Source: Philosophy & the Matrix" is the first, as it trots out a legion of professors, historians and other science-fiction literary types to make the case for the significance of the World According to Neo. Some of the connections these guys pull out are pretty incredible, as they cite everyone from Descartes to Nietzsche to Plato, as well as compare sections of the films to both the Old and New Testament, the Koran and the Book of Revelations. Your tolerance for "Return to Source" will likely vary based on your beliefs, and though I admit I snickered more than once, it's fascinating how passionate the supporters of the Matrix are in their beliefs. Just as intriguing is "The Hard Problem: The Science Behind the Fiction." One of the key thematic devices of the Matrix technology is the fusion -- and fight -- of man and machine. Another army of experts and pundits are brought out to analyze the history of emo-tech, though "The Hard Problem" doesn't really use 'The Matrix' as a jumping off point for these ideas. Instead, it's more of a History Channel-esque scientific journey of man's growing reliance on machines and where the future of artificial intelligence may lead us. This is certainly the most cursory documentary on the entire 'Ultimate Matrix Collection,' but a nice respite from all the more technical making-of material. Finally, we get to Disc 5, the second disc of 'The Matrix Experience,' and the last of this set. Side 1 features "The Burly Man Chronicles." Much as 'The Matrix Revisited' was to 'The Matrix,' this 95-minute production diary of the four-year shoot of the two sequels is quite exhaustive. Yet, amazingly, there is nary any repetition with the other material on the set. Technical nitty-gritty is largely jettisoned in favor of the arduous task of conceiving and conceptualizing back-to-back sequels, the rigors of the cast in trying to comprehend and articulate the vision of the Wachowskis, and of course the huge commercial expectations that bore heavily on the minds of the filmmakers and the studio. I personally preferred this single, comprehensive documentary over all the little bits and pieces on the stand-alone discs. Nearing the end of our 'Matrix' journey, we come to Side 2 of Disc 5. Here we have "The Zion Archive," which is an absolutely massive still gallery that has to be seen to be believed. Simply put, it the most extensive such assemblage I've ever seen on any DVD or high-def release, hands down. There are over a thousand stills -- yes, a thousand -- enough that fans could go pour through this stuff for days. Unfortunately, the navigation is frequently annoying. Though the material broken down into five obvious categories -- "Storyboards," "Characters," "Ships," "Machines" and "Sets" -- the menu text is often convoluted and weirdly inaccessible. By this point, after spending days wading through this set, I'd long since tired of all the arcane 'Matrix'-speak. And again, it's a disappointment that none of these many, many gorgeous pieces of conceptual and storyboard art have been upgraded to high-def resolution. Two more oddities are included: "Rave Reel" is a 9-minute montage of clips from all three 'Matrix' movies, but since the rave scene in 'Reloaded' is considered by many fans to be the low point of the series, perhaps putting the words "rave" and "Matrix" together one more time really seems like a bad idea. "The Matrix Online Preview" is also dated -- a 10-minute sneak peek at an online gaming version of the "Enter the Matrix" game that has probably long since been forgotten. Finally, 'The Matrix Experience' concludes with a collection of all the same theatrical teasers, trailers, TV spots and music videos that have already been included on the stand-alone discs for each film. 'The Ultimate Matrix Collection' comes with huge expectations, but overall it manages to lives up to the hype. Granted, the trilogy as a whole suffers from the law of diminishing returns, but it is impossible to argue with the series' lasting impact and influence on pop moviemaking. And in sheer technical terms, Warner has certainly done this landmark sci-fi franchise proud on HD DVD. The video and audio are five-star stunners, and the long list of supplemental materials simply boggles the mind, even in standard-def (as it is presented here). So do I have any caveats at all in recommending 'The Ultimate Matrix Collection'? Just one: its price. At $119.98 list, this one's a considerable financial investment -- especially since 'Reloaded' and 'Revolutions' are not particularly well-regarded, even by diehards. Yes, you can pick up the scaled-down 'Complete Matrix Trilogy' for a little bit less, but I think many fans would opt for a stand-alone version of just the original flick if they had the chance. Still, 'The Ultimate Matrix Collection' stands tall as a trend-setting release for HD DVD -- as of this writing, it has thrown down the gauntlet for all next-gen box sets that follow.